Columbia Basin Allied Arts welcome you to attend an evening you won't forget! "The Pirates of Penzance hardly needs an introduction… as one of the best-loved pieces of musical theatre in the English speaking world." Children have always been attracted to Pirates because of the childlike behavior of these gentle souls and their earnest apprentice. Historically the idea of “noblemen who have gone wrong” is not only familiar child’s play but also close to the truth. Most famous “pirates” were political or social outcasts from the upper classes. Gilbert’s satiric and deliberately silly ending actually has real historic validity! 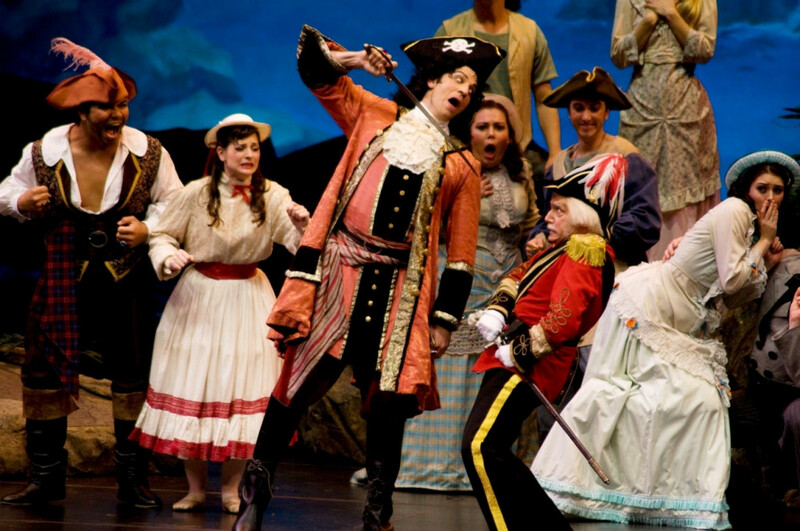 From a performing company’s perspective Pirates has many charms. First and foremost is the predominant role that the chorus plays, and the opportunity for individual characterizations within the ensembles. The interaction between the various groups of pirates, policemen, and daughters is particularly playful and always delights both the audience and the cast participants. Another colorful aspect is the wide range of the vocal parts, from the very high coloratura soprano of Mabel and the lyric tenor of Frederic, to the growly low bass of the policemen… It is an oddity of the printed score that the Major-General is listed as singing with the basses at certain points and with the tenors at other times - certainly not a musical necessity and rarely followed in practice. To describe Pirates as a romp is surely no exaggeration. It’s representation of naivetéé, romance, and sentiment - all mixed with wit and sophisticated verbal by play - leaves the audience and performers alike with a giddy sense of joy that is timeless. I’m sure that Pirates will remain a staple of the G&S canon for as long as these classic operettas continue to enthrall the child in all of us!